Hair stylists, nail technicians, estheticians—they are all in the business of making people feel good about themselves. But sometimes, they have to say “no” to customers, as much as it may seem contrary to their mission (and their bottom line). Why would I encourage salons and spas to turn away customers or refuse their requests? Because in some instances, serving a customer may do more harm than good. Consider this situation: One Tuesday around lunchtime, a woman shows up for her hair appointment and asks her stylist, Sarah, to take her long locks from chocolate brown to platinum blonde. Sarah cautions that this is a time-consuming venture, which requires a long wait as the bleach is applied, the hair is wrapped up in foils and the dye processes. Before Sarah begins mixing chemicals, the client asks if she can run out later, for 15 minutes, in the middle of the processing, in order to pick up her son from school. Sarah hesitates, but agrees that as long as the client comes right back, it should be safe. 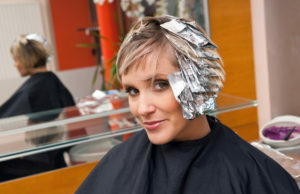 The client agrees, and Sarah applies the bleach and wraps her hair in foil. Unfortunately, when the client leaves, she is gone for far longer than 15 minutes—and by the time she returns, her scalp is not only burning, it is red and irritated. She later develops serious skin irritation and blames the salon, attempting to hold them liable for her medical bills. A gentle “no” could have prevented that outcome. In fact, Sarah didn’t even have to refuse service; the client warned that she would need to run out mid-way through the long appointment. Sarah could have simply helped her reschedule the appointment for a later date. Someone arrives for a manicure with fingernails that appear to be infected. A client rolls up her pants for a pedicure and reveals an open sore on her ankle. An opportunity arises to purchase discounted chemicals and products from overseas—outside the purview of the FDA. A client asks for a brow wax after an esthetician has performed a facial with several powerful exfoliating products. A customer asks to skip the hair dye patch test to save time. This is by no means an exhaustive list of scenarios, but these examples demonstrate an important point: when the health and safety of a client or beauty professional is at risk, saying “no” may be the most positive thing you can do.